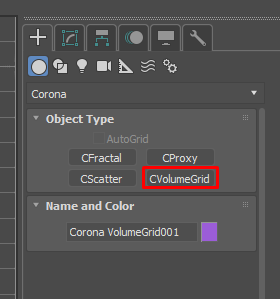 How to use the Corona Volume Grid? What are the available controls? How to use the Channel Color Mapping tool? How to get the fastest rendering and the best quality? Aren't Corona Volume Grid controls similar to those found in the Corona Volume Mtl? The Corona Volume Grid allows you to render objects which are truly volumetric and based on a 3D grid, as opposed to meshes with the Corona Mtl or Corona Volume Mtl, which always require some kind of surface consisting of polygons to display the volume. The Corona Volume Grid can be created by going to the Command Panel and then Create > Corona > CVolumeGrid. The Corona Volume Grid also supports animated OpenVDB files (.vdb sequences). Note: if you need information about the remaining controls, you can hover your mouse over their names to see tooltips. Toggles emission for the volume. This can be seen as the temperature of the tiny smoke particles. The higher the temperature - the brighter the particles glow. Channel - Selects the channel (grid) present in the OpenVDB file that will be used for medium emission. Usually it should be set to "temperature" to get results such as fire or explosion. There is also an additional channel called "constant" - it is a single solid color, which is applied to the whole bounding box of the volume. 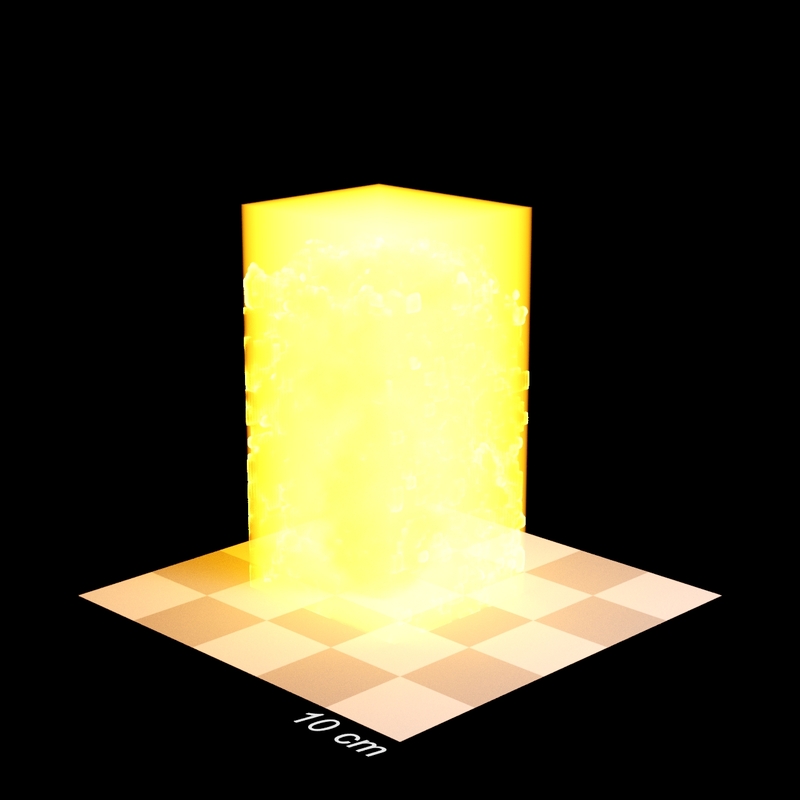 In case of using "constant" mode for the emission, the whole bounding box of the volume grid object will start glowing. This channel is useful, for example, for scattering when creating smoke - you can set constant scattering color to have the same type of scattering inside the whole medium, and then its thickness will be controlled only by the absorption properties. Emission channel set to "constant". Scale - makes the overall emission more or less intensive (higher values mean higher intensity). Tint - this color is applied to the emission (you can see it as a kind of filter). Emission tint set to blue. Map - this is the mask used for emission. Note that the mask is applied in 3D space, so adding a noise map will result in having a 3D noise mask applied to the object. 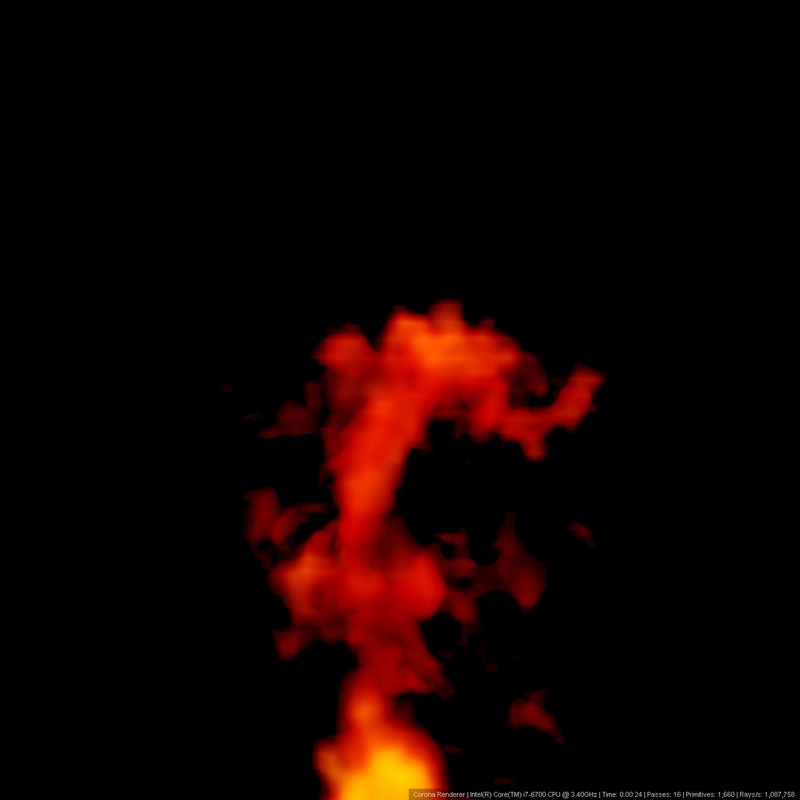 Procedural noise used as the map for emission. Raw data - uses the original color and intensity which is stored in the vfb file. It is then affected by scale and tint parameters. 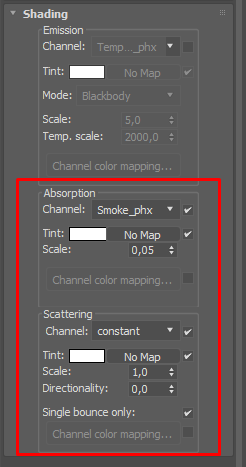 Channel mapping - uses custom settings from the "Channel color mapping" tool. See "How to use channel color mapping" below. 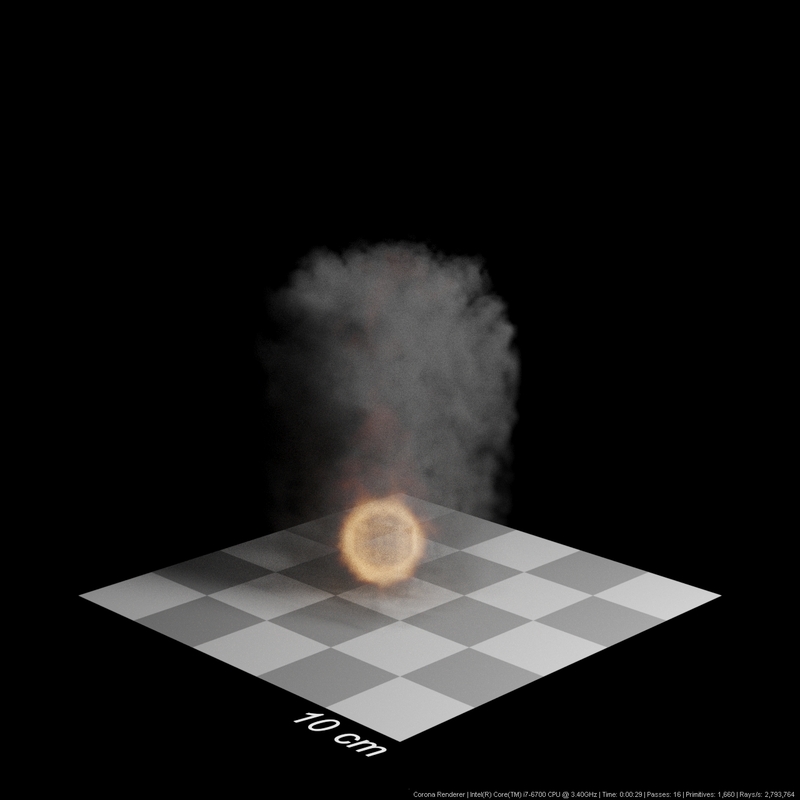 Blackbody - simulates color emission of a blackbody at given Kelvin temperature (useful for fire simulations). Decides how far light can travel inside the object before it is fully consumed. Channel - Selects the channel (grid) present in the OpenVDB file that will be used for absorption. Usually it should be set to "smoke" to get results such as fire or explosion. There is also an additional channel called "constant", which fills the whole bounding box of the volume grid. Lower absorption scale. The smoke appears thinner. Higher absorption scale. The smoke appears thicker. Tint - this color is applied to the absorption (you can see it as a kind of filter). Map - this is the mask used for absorption. Note that the mask is applied in 3D space, so adding a noise map will result in having a 3D noise mask applied to the object. Decides how light is scattered inside the volume. Channel - Selects the channel (grid) present in the OpenVDB file that will be used for scattering. Usually it should be set to "constant" to have the whole medium scatter light in the same way in the areas where absorption allows this, but other channels may work fine too, depending on the needs. Scale - makes the object scatter light more or less (higher values mean more scattering and brighter overall color). Lower scattering scale. The smoke appears darker. Higher scattering scale. The smoke appears brighter. Tint - this color is applied to the scattering (you can see it as a kind of filter). Scattering tint set to blue. Directionality - directionality of the scattering. 0 produces isotropic ("diffuse") scattering. Positive values produce forward scattering. Negative values produce backward scattering. Default value of 0 is suitable for most media, with the exception of clouds, where higher positive numbers will produce the effect of "silver lining"
Single bounce only - This option should be enabled, unless disabling it is absolutely necessary. When enabled, only single bounce (direct lighting) will be scattered in the medium. This results in a biased (darker), but much faster rendering. Useful e.g. for rendering "god rays" inside the medium. Interpolation - decides about the speed to quality ratio. It is similar to filtering used in many applications when dealing with 2D textures. "None" will give fastest rendering, but lowest quality with a possibility of "pixelated" or "blocky" appearance of the grid. "Linear" is a compromise between quality and render speed, and this mode is used by default. "Quadratic" will produce best quality, but at the cost of render time. Interpolation set to none. Render time: 24s. The result is visibly "blocky". Interpolation set to linear. Render time 24s (the same as when using no interpolation). The result appears much smoother and more natural. Interpolation set to quadratic. Render time 31s. 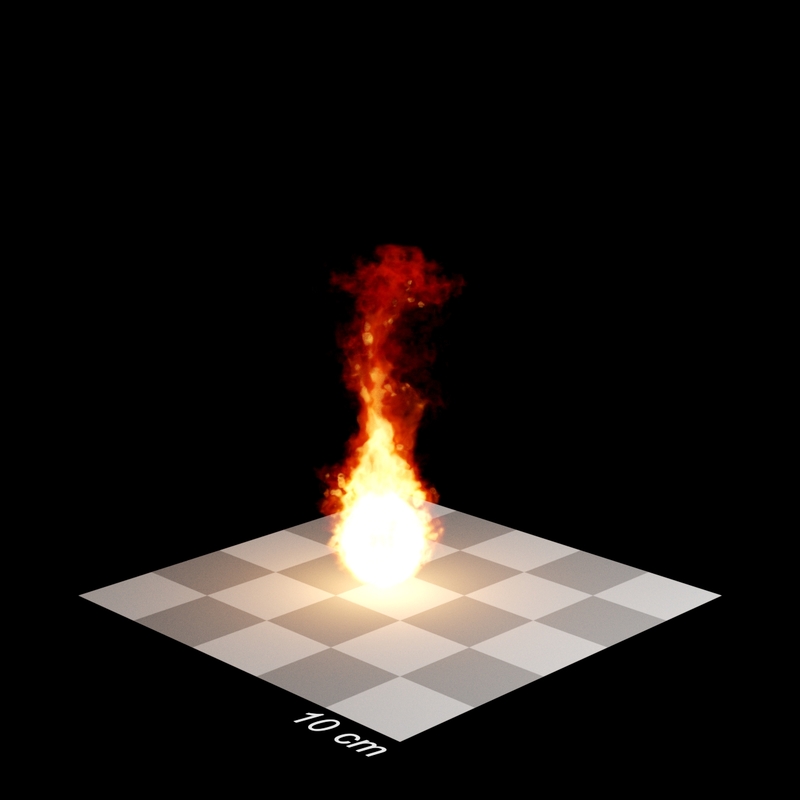 The result appears more natural, but the rendering is slower. Step size - ray marching step size. Decides how many "volumetric steps" can be used to render the object. Higher values mean faster rendering, more noise, and higher possibility of artifacts showing up. Lower values mean better quality, but slower rendering. 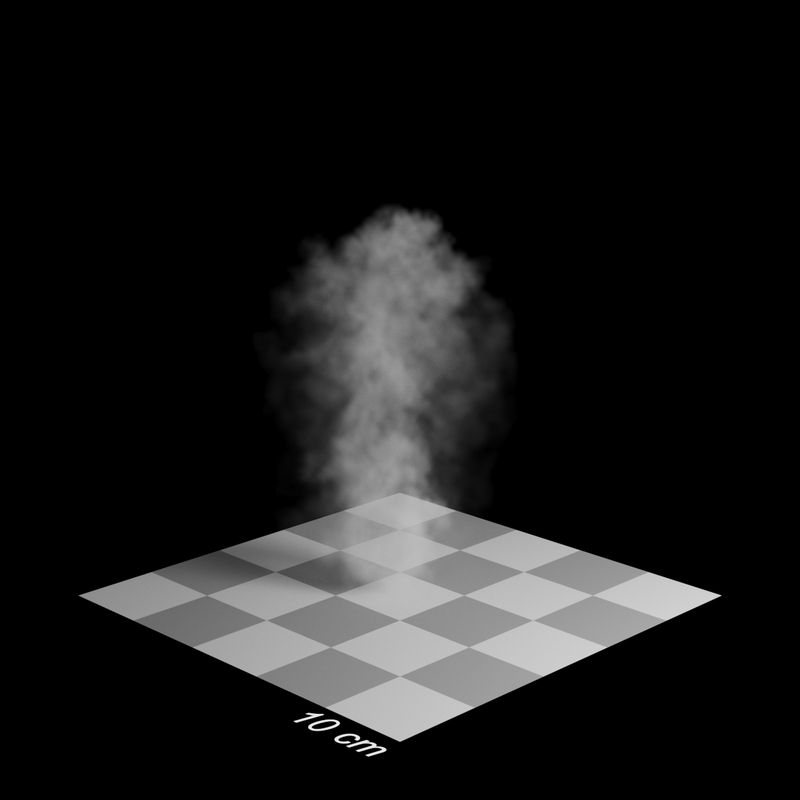 To get reasonable render times, the step size should be set to as high value as possible, until ray marching artifacts are visible ("slices" visible inside the object). Step size 0,5cm. Render time 3min 46s. The smoke is thick, and details are preserved. Step size 5cm. Render time 48s. The smoke gets thinner, and there are less details visible. Step size 50cm. Render time 29s. The whole object becomes transparent and the details are lost. Flip frame - flips the OpenVDB file's Y and Z axes, which results in the object being rotated by 90 degrees. This option should be used if the object appears to be incorrectly rotated when loaded. Preview type - use bounding box or point cloud viewport preview for the OpenVDB file. Warning: the point cloud preview can be slow when a large file is loaded. Preview quality - the density of the point cloud preview. Motion blur - decides how motion blur is computed. Velocity - selects the channel which stores velocity information for the motion blur calculations. Usually "velocity" should be used for this. Multiplier - strength of the motion blur effect (higher values mean more pronounced motion blur). Emission and scattering are disabled (since we do not need them). Absorption is enabled and set to a high scale. 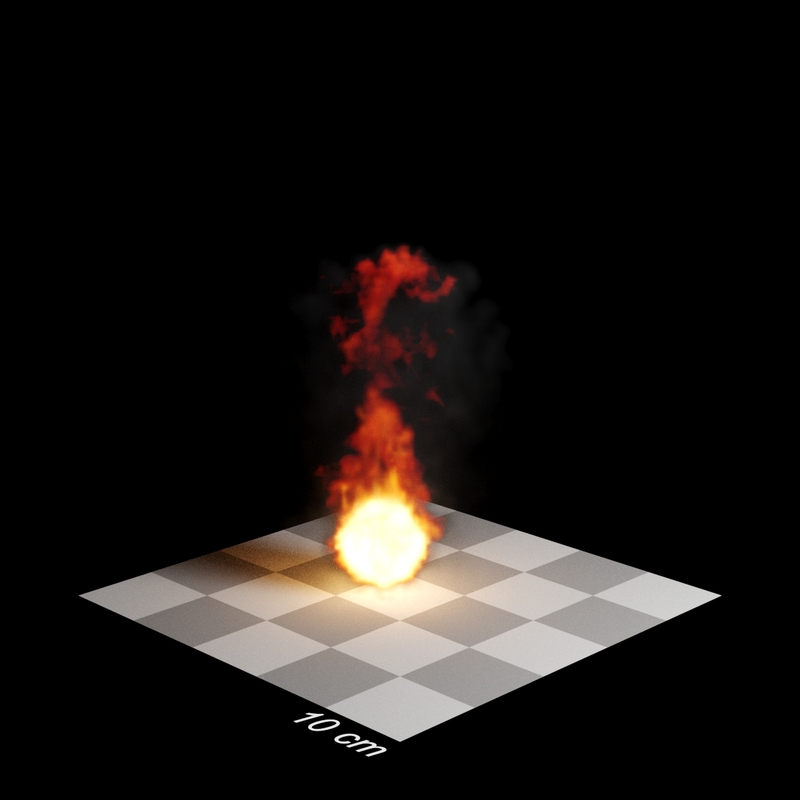 Emission is enabled since we want to render the emissive fire part. Emission scale is set to 5 to boost intensity. Blackbody mode is selected for the emission, since we are rendering realistic fire. 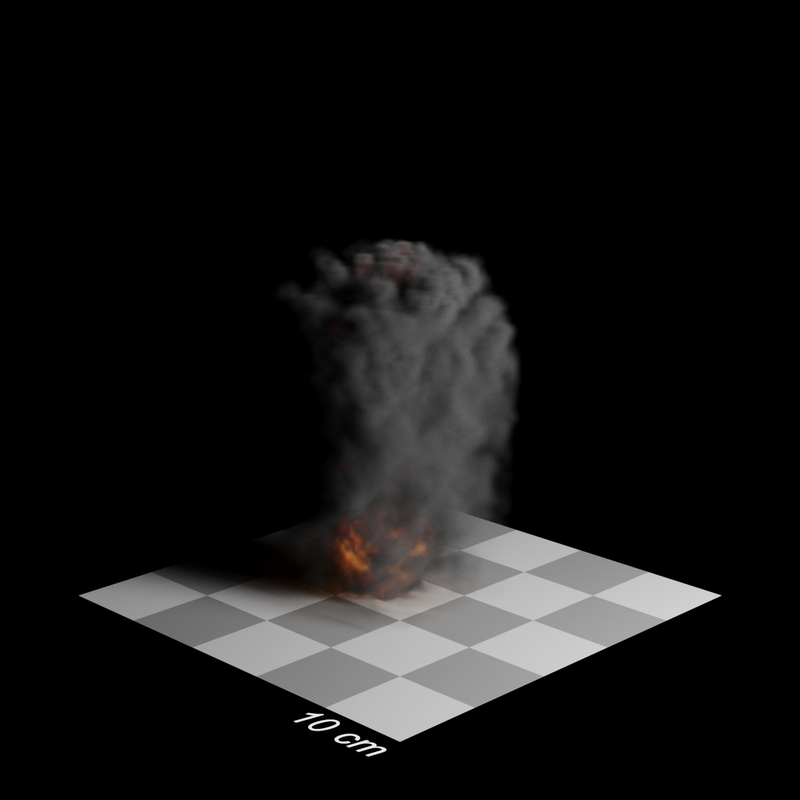 Absorption is enabled to render the smoke, however its scale is reduced to 0,5 as we'd like the smoke to be thin. 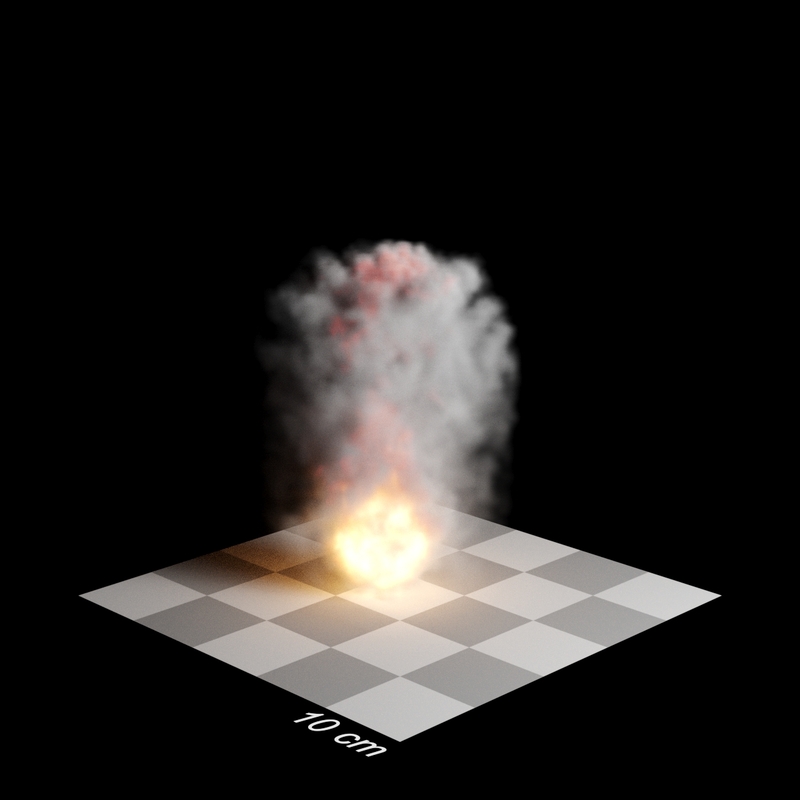 Scattering is enabled with the scale set to just 0,05 for a weak scattering effect. We do not need emission for this example, so it is left disabled. 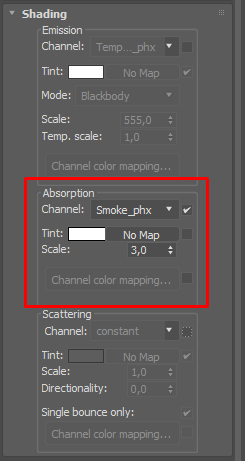 Absorption is enabled, however its scale is lowered to 0,05 to make the steam transparent. Scattering scale is set to 1 to make the steam appear bright. We are using emission, absorption, and scattering. To achieve the purple hue of the smoke, we are using a custom scattering tint color. 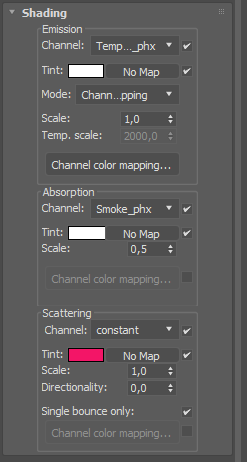 For the colorful fire, we are using the channel color mapping option for emission (see below for further information and a mini-tutorial). Simply put, channel color mapping can be used to color the properties of the volume grid (emission, absorption, scattering) based on a gradient. For example, a red-yellow gradient can be used to create realistic fire. 1. First the float values are scaled by the "Input scaling" so they fit into [0,1]. One can use the "Auto-scale" button to compute the input scaling value automatically. 2. Float value is mapped to color using the color gradient. The left most color of the gradient defines how the value of 0 is mapped to color, while the right most color defines how the value of 1 is mapped to color. 3. The color computed from the gradient is scaled by the curve. Note that the curve input is not the color from the gradient, but the "input-scaled" floating vaue from the channel (i.e. the result of operation 1). 4. The final color is computed by scaling the color back using inverse of "Input scaling". Set emission channel to temperature. Set mode to "Channel mapping". Open the "Channel color mapping" window. Press "Auto-scale" button to automatically adjust the scaling value. 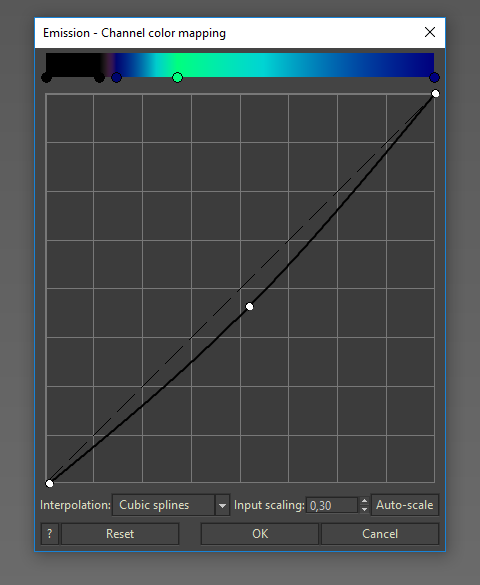 Moving the bottom-left point towards the top of the graph will make the darkest colors more intensive. Note: this is useful for getting rid of the shape of the volume grid's bounding box being visible in the rendering. Moving the top-right point towards the bottom of the graph will make the whole effect less intensive. Moving the top-right point towards the left side of the graph will make the whole effect more intensive (note that this can often make the effect appear burnt out). You can also add points in other places of the curve to control the inbetween values, and you can switch between cubic ("bezier") and linear ("corner") splines. At this point, adjusting the "Input scaling" value will make the overall effect more or less intensive. 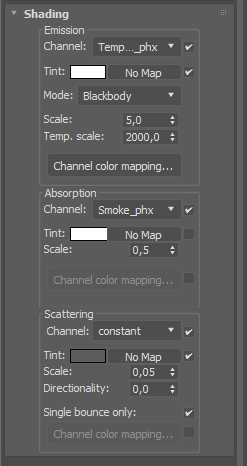 If you press OK and close the channel color mapping window, you can then return to the "Shading" rollout of the Corona Volume Grid object and adjust the Emission scale parameter. It will work in a similar manner to the "Input scaling" inside the channel color mapping window, but will adjust the intensity after the color mapping is done. This means that if you have removed the visible bounding box from the volumetric effect using the controls provided in the channel color mapping window, then there is no way to show the bounding box again using the Emission scale parameter. This can be used to adjust the intensity of the effect after the overall color and visibility has been set up (e.g. making fire brighter). If you are rendering only the Volume Grid object against a solid background (without any surrounding environment such as interior or exterior), go to Render Setup > Performance and lower the GI vs. AA from the default 16 to a lower value (such as 4, but not lower than 2). This will make rendering of the Volume Grid object faster, but may introduce noise in other parts of the image, such as glossy reflections or refractions. Since some parts of the Volume Grid may rely mostly on direct lighting (this is visible when absorption and scattering are used), it may make sense to increase the Light Samples Multiplier value under Render Setup > Performance. This will improve the quality of the light penetrating the light-scattering part of the object (such as smoke, steam). In the Grid Object's settings, go to the Rendering rollout and set Step size to the highest value possible. Too low values will render extremely slowly. Too high values will reveal ray marching artifacts ("slices" or "cubes" visible in the object), and will make the object appear unrealistically transparent. Objects with lower emission scale will always render faster, as less light will be generated, which will in turn generate less noise. Objects with lower scattering scale (darker color) will always render faster. Respectively, bright scattering (e.g. color set to pure white) will render slower. 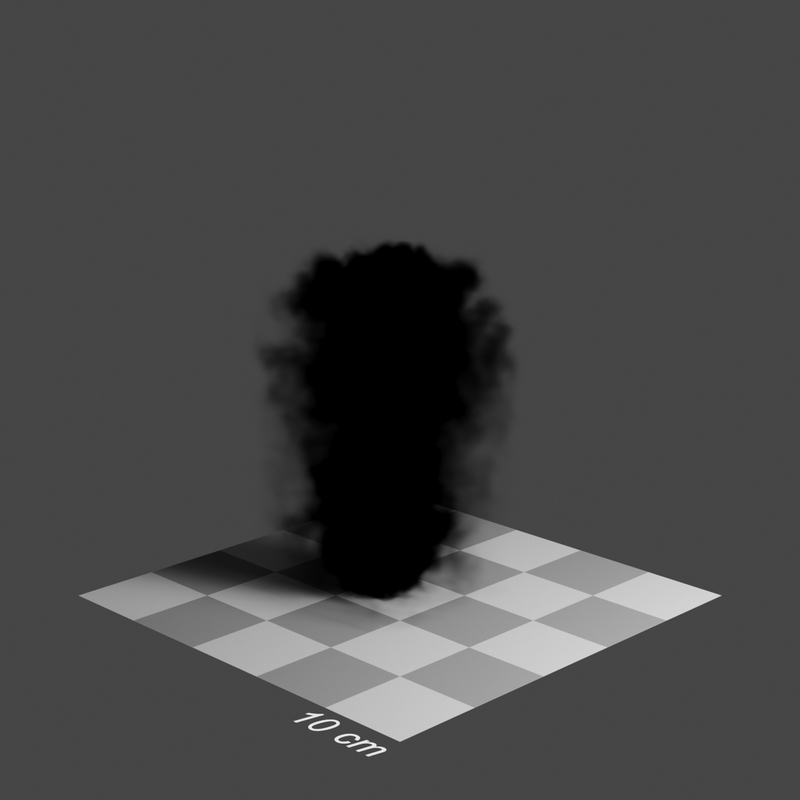 Always use the Single bounce only option under Shading > Scattering inside the Volume Grid object. Disable this option only when it's absolutely necessary. Enabling it will usually bring just a little quality improvement, and will make rendering a lot slower. Yes, the controls available in the Corona Volume Grid object are very similar to those found in the Corona Volume material, and they produce very similar results. If you are familiar with the Corona Volume material and SSS effects in Corona, then the volume grids shouldn't be a challenge for you! What are the two available SSS modes? How to use subsurface scattering?